n American cuisine, the French dip sandwich, also known as a beef dip, is a hot sandwich consisting of thinly sliced roast beef on a "French roll" or baguette. It is usually served topped with Swiss Cheese, onions, and a side of beef juice from the cooking process. To make dipping Sauce - heat broth & seasoning and place beef to heat. In a skillet . saute Onions until golden brown. In a hot Oven Toast bread- until golden brown. Sandwich Layer - Beef,onion and top with cheese. 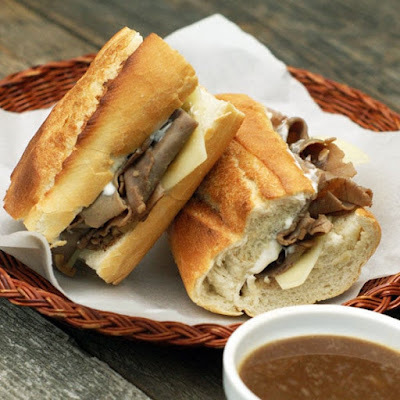 Reserve the beef stock for dipping sandwich.